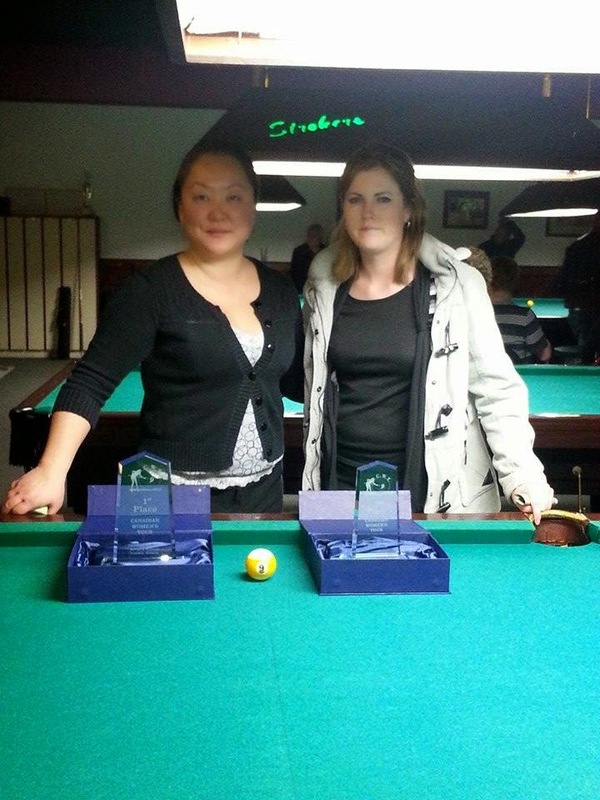 The amateur Canadian Women's Tour had their 4th stop on Saturday December 6, 2014 at the lovely pool hall Strokers Billiards and Other Diversions in London, Ontario.Despite having their own in-house tours and other independent tournaments, they were able to accommodate the ladies tour and it brought out probably the strongest field to date. From the veteran's list are VNEA champions Maureen Van de Ven who also won tour stop #1, Kayla Jones and recently returning from China representing Canada at the World Junior Championships was Kayla Roloson.There was also tour stop #3 winner Hanna "The Korean Assassin" Kwon and experienced tournament player Suzanne Peters running the show as well as playing. Newcomers Anita Chan and Donna Sasges, locals from the London area, came out to try their luck. Chan has had previous tournament experience playing in the 404 as well as the VNEA and Sasges has also competed in the VNEA as well as the former Tiger Canadian Women's Pool Tour. Van de Ven played tournament rookie Shaw. Solid potting from Van de Van and unluckily for Shaw, who at a score of 5-3 in a 7-5 race, had lost the cue ball in the following two racks after successfully potting the combinations shots on the 9-ball.Van de Van went on to win 9-5.Peters and Roloson were up next next, Going neck and neck, Peters squeaked by in a nail-biting hill-hill battle to win 8-7 in a straight race to 8.Jones defeated Chan decidedly with a score of 9-3 in a 9-5 race and Kwon was taken down by Sasges with a convincing score of 6-7. As the day went on, it was clear that all of the players were struggling with the speed of the tables. The cue ball could not seem to avoid going into the pockets or shape was a struggle as the cue ball seemed to run a lot further than anticipated.In the end, it was Peters and Jones in the A-side finals and Kwon and Sasges in the B-side finals. On the streaming table, both Peters and Jones were having difficulty finding their rhythm and often times turned into a safety battle.Jones turned the tables near the end and pulled out a win over Peters to advance to the hot seat. Kwon had her opportunity to seek revenge against Sasges in the B-side finals and which she did by dominating the match with a definitive win of 9-3.It is now Peters and Kwon looking to fight to play Jones in the finals. In a 9-8 race, it was head-to-head until the defensive play of Kwon gave her the edge to advance to the final match.In this true double elimination format, Kwon would need to defeat Jones twice in order to win the tournament. In a straight race to 9, a rocky start by Kwon had Jones leading for more than half the match at which time Kwon clawed her way back to win the first set 9-6. Second set, Jones was determined to not allow Kwon take another game, let alone the match. However, it was not to be this time as Kwon was carrying her momentum from the previous match into this final round and won easily 9-2. This event would not have been possible without Ronda Drew-Clement of Strokers accommodating the tour, Wayne Dwyer as our streaming expert and referee, and of course, Suzanne Peters for making this tour happen.Next event will be on January 17, 2015 back at Petrina's Billiards in Ajax. Hope to see everyone there! *Note: Hanna Kwon has had a very big year winning multiple times on the Billard Feminin Tour and the Canadian Women's Tour. She has also had some top finishes on the AA circuit in the Quebec Federation which as resulted in her gaining some attention. 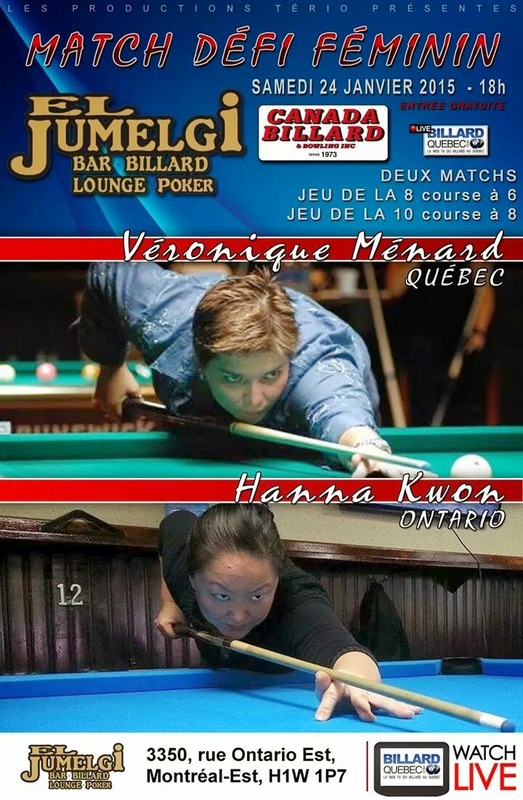 Thus there will be a challenge match coming up next month between Kwon and one of the top Canadian Female players around Veronique Menard. Take a look at the poster below for more details. Have You Heard of Pool Stream TV?